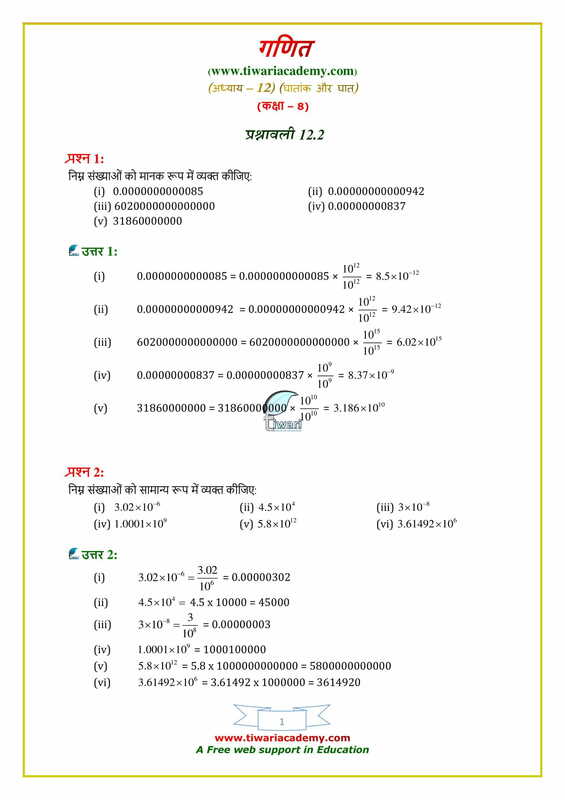 NCERT Solutions for Class 8 Maths Chapter 12 Exercise 12.2 Exponents and Powers in English Medium and Hindi Medium simplified form and convenient way of presentation. 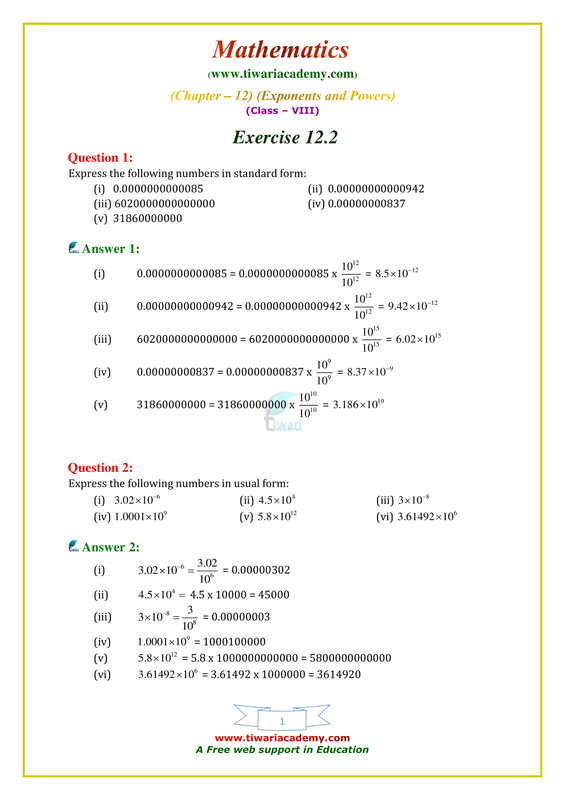 Extra questions for practice are given below for practice. 1. Some migratory birds travel as much as 15,000 km to escape the extreme climatic conditions at home. Write the distance in metres using scientific notation. 4. A sugar factory has annual sales of 3 billion 720 million kilograms of sugar. Express this number in the standard form. 5. The planet Uranus is approximately 2,896,819,200,000 metres away from the Sun. What is this distance in standard form? 1. The cells of a bacteria double itself every hour. How many cells will there be after 8 hours, if initially we start with 1 cell. Express the answer in powers. 2. About 230 billion litres of water flows through a river each day. How many litres of water flows through that river in a week? How many litres of water flows through the river in an year? Write your answer in standard notation. 3. The volume of the Earth is approximately 7.67 × 10^–7 times the volume of the Sun. Express this figure in usual form. 4. A new born bear weighs 4 kg. How many kilograms might a five year old bear weigh if its weight increases by the power of 2 in 5 years? 5. Special balances can weigh something as 0.00000001 gram. Express this number in the standard form. 1. One Fermi is equal to 10^–15 metre. The radius of a proton is 1.3 Fermis. Write the radius of a proton in metres in standard form. 2. There are 864,00 seconds in a day. How many days long is a second? 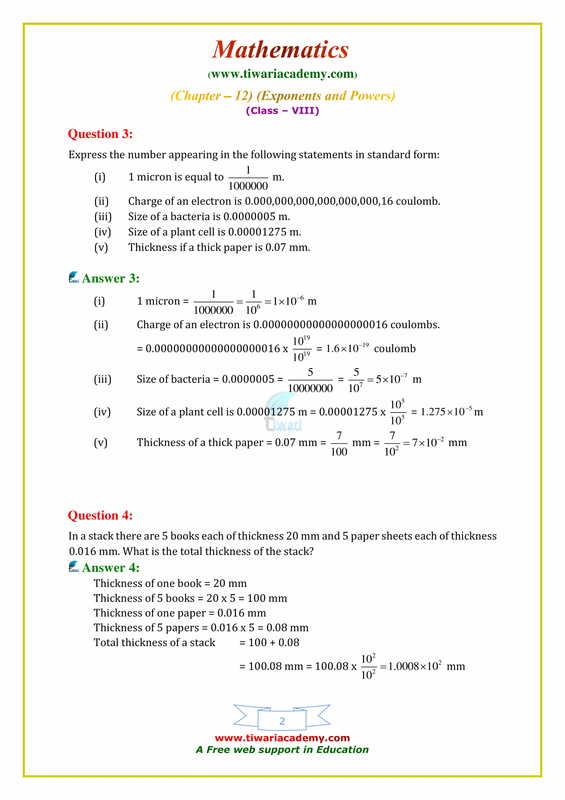 Express your answer in scientific notation.